Boonchai Suwatsakulsawasd; General Manager of the Centara Duangtawan Hotel Chiang Mai, together with The Management Team presented a welcome garland welcome Khun Yingluck Shinawatra ; Thailand’s Prime Minister while she presided over a conference at Duangtawan Grand Ballroom in the hotel recently. Phuenthai German Intl. Org. board member Heiko Schmidt, invited some of his Chiang Mai friends to his 53rd celebrated at Le Meridien Hotel in Chiang Mai. 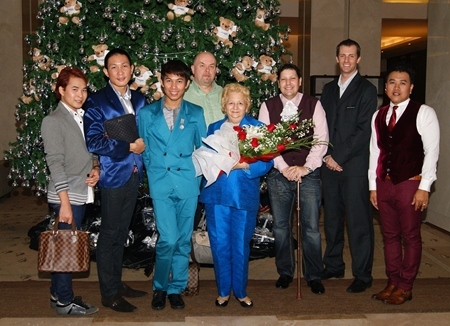 From left; Anirut Hanchumset, Khun Mec, Bobby Khotbuntao, Heiko Schmidt, Janet Henry, Dirk Weeber-Arayatumsopon, Michael Hofstetter (Food and Beverage Manager of Le Meridien Chiang Mai) and Wuttipong Arayatumsopon. 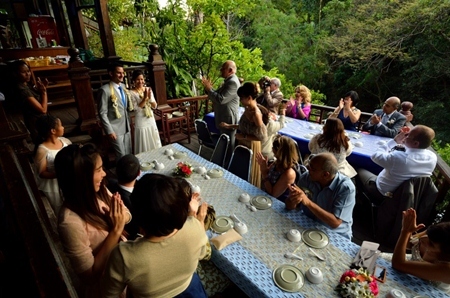 Anne Atchara Changwong and Rafael Ricardo López Sánchez are toasted by their guests at their wedding party held at Huen Huay Kaew Restaurant on Saturday, December 29, 2012. Parents of the bride are Mr. Somsak Changwong Mrs. Saengduan Changwong. Parents of the groom are Mr. Rafael López Álvarez and Mrs. Iraida Sánchez de López. (Photo courtesy of Ryan Libre and Non). 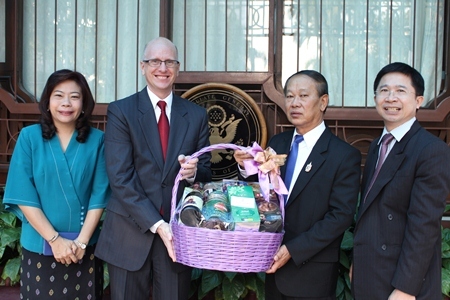 Cape and Kantary Collection Project Development Manager Tirawan Pangsrivongse (left), representing Kantary Hills Hotel, recently donated Baht 200,000 in scholarships to the orphans of The Seven Fountains, Jesuit Spirituality Centre of Thailand, Chiang Mai, through Father Winai Boonlue.